Nestled between two marinas with a view of the carferry dock is Waterfront Park. Since its unveiling in 1999, the park has been a focal point in Ludington, and a favorite backdrop for that perfect photo. Families love to spend time together at Waterfront Park. The expansive playground keeps kids entertained, while parents relax on a comfortable bench and watch the S.S. Badger carferry sail into port. Or enjoy a picnic at one of the tables in the park, with the breeze off Pere Marquette Lake cooling you on a hot day. 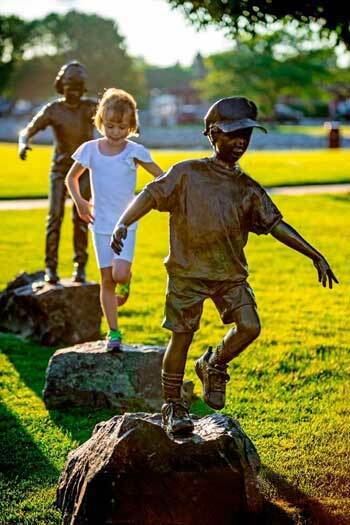 Take a walk on the scenic pathways and learn a bit of history from the nine bronzed sculptures placed throughout the five-acre park. Night lighting, restrooms, and an amphitheater for summer concerts are just added features that bring people of all ages to Waterfront Park. Annual events that take place every summer at this gorgeous venue include LudRock and the Rhythm & Dunes Concert Series sponsored by West Shore Bank. Condominiums on the east and south sides of the park bring a new type of living to the waterfront. These units vary in style, but all give you spectacular views of the park, harbor, and downtown region. Many shops and restaurants are within walking distance, which is why more people are choosing the "condo" way of life. When you need life to slow down a bit, come on down to Waterfront Park and take a long, deep breath. Here you'll discover the true magnificence of beautiful, lakeside living. From downtown Ludington, go past all three stoplights, and two streets down, turn left on William Street. Follow two blocks down and straight into Waterfront Park.